It’s hard to believe that it has been just three short months since Shloime’s debut album hit the stores here in the United States. In that short amount of time, he has become a household name, as Jewish music lovers can’t seem to get enough of him. His recent trip to Eretz Yisroel proved that Israelis from all walks of life love Shloime’s music just as much as we do. This trip should have actually taken place weeks ago, but Shloime has been so busy with chasanas here in America, that it took time until a face to face meeting with Greentec, Shloime’s Israeli distributor, could finally be arranged. The trip was a huge success. While Israelis are familiar with Shloime’s music, they never got a chance to meet with Shloime, talk to him and get to know him. Until now. What a week it was! Shloime met with virtually every Israeli radio station and music website. In his visit to the various Greentec locations, Shloime met so many people from all walks of life, who were so glad to get to meet him in person and get to know the man behind the music. Countless times, people walked into the stores where his CD was playing and bought his CD on the spot. 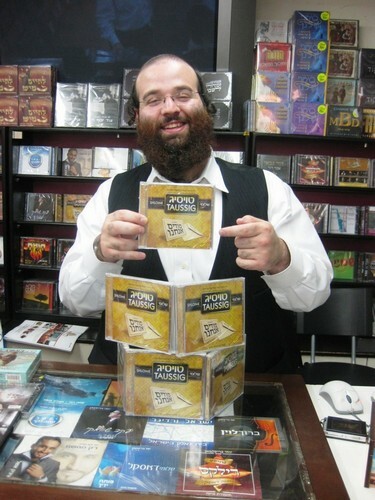 Sefardim, Chassidim, Ashkenazim – no matter what their background, his music seems to resonate with everyone. So many people wanted more details about Shloime’s trip — what follows is a day by day, play-by-play. Enjoy! Monday, August 17th: Shloime arrives in Eretz Yisroel. You’d think after a long trip Shloime might want to relax, but that certainly didn’t happen. Shloime’s day was jam packed. It started with a meeting with Kobi Sela, who was responsible for all Shloime’s public relations in Israel. From there he moved onto an interview with Chasidi News. Shloime even did a YouTube video thanking Chasidi News for their time. Next up, a meeting with Shlomo from Greentec, Shloime’s Israeli distributor. No time for rest as Shloime traveled to Bnei Brak to sing at a wedding with Ruvi Banet’s eight piece band. Shloime’s golden voice made a beautiful simcha even more beautiful. To hear for yourself, check out the YouTube clip of Shloime singing Anavim and Sholom Aleichem at the wedding. After that, it was on to a meeting with Shua Fried, who arranged two of the songs on Shloime’s album. Shua had never seen Shloime sing live before and could not believe how Shloime managed to connect with the oilam on so many different levels. By four o’clock in the morning, it was time for Shloime to finally call it a day and get some well deserved rest.